A few weeks ago the girls had an assembly at their school. Ronald McDonald lead the assembly & I'm not exactly sure what he was advocating. 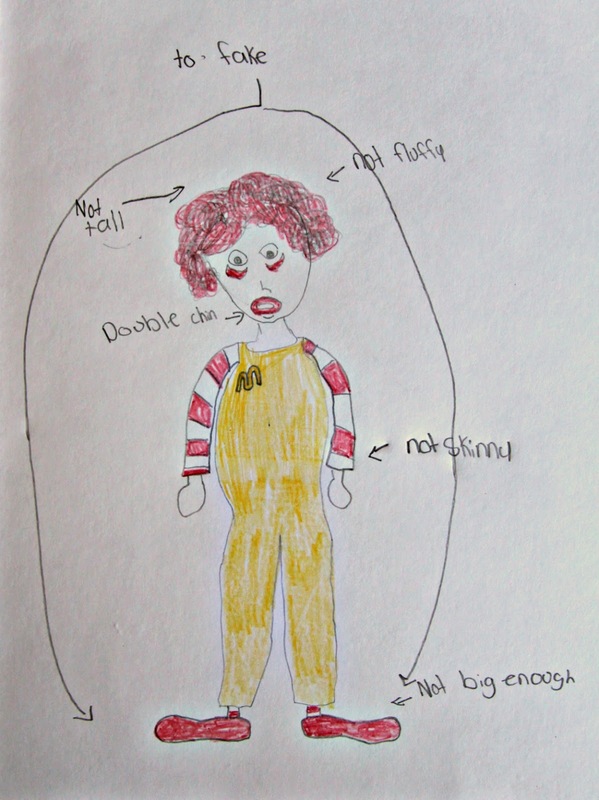 The girls described him as wearing a flat red wig, being short, & much more round than the REAL Ronald McDonald. 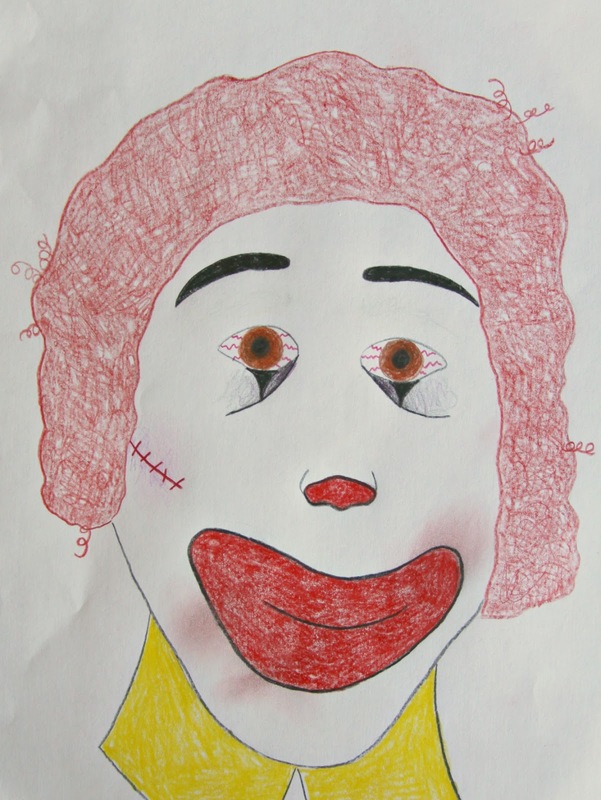 The Ronald imposter also did magic tricks, like the one where you flip through a color book (which is blank), & then you perform some sort of voodoo & then flip back through the book—& Wa-lah!—it is all colored in. But, anyway, the girls were frightened of him. Pazely even mentioned something about covering her eyes at one point. All the kids high-fived Ronald McDonald on the way out, but she bypassed all that hooplah & hightailed it out of there. Their aversion to this red-haired, sunshine-colored-jumpsuit wearin', burger-lovin' clown is all my fault. At the local McDonald's in town there are a couple pictures & cutouts of Mr. McDonald posted along the drive-thru as you drive along. 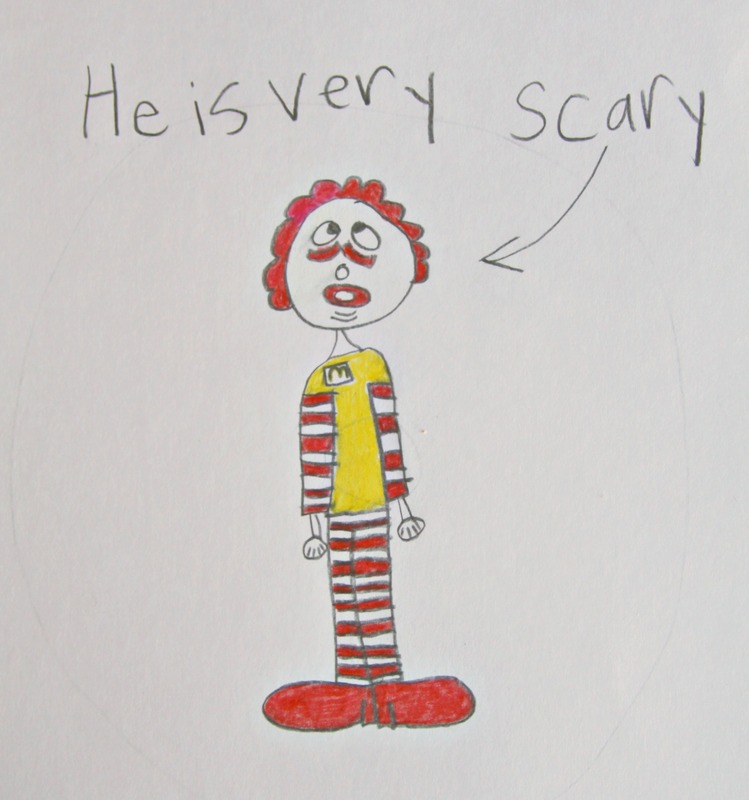 And every time we go to the drive-thru, which isn't very often, I always make a creepy voice as we pass Ronald & say things like, "Enjoy your happy meal, kiddies." or "Don't eat too many fries little girl!" (The voice I use is a cross between Stripe the Gremlin & Clint Eastwood.) And then I'll laugh real evil at the end. I have terrorized my children. Which is a shame. Because I have such happy memories of ole Ronnie baby. Who they should really be afraid of is that giant purple misshapen jellybean character. (Who is named Grimace & likes to steal milkshakes.) Seriously, weirdest character EVER. My girls never got to experience the old-school classic McDonald characters. I remember playing on the McDonald playgrounds as a kid, where I would slip down the Captain Crook spiral slide or have a go on the Fry Guy bouncers. I remember climbing up, & sitting inside, the Chief Big Mac jail. And whirling-n-twirling on the Burger Spinner! Man, what a thrill! I always got the same thing to eat, everytime I got to go to McDonald's: a Happy Meal with chicken nuggets. I dipped the nuggets in the little containers of honey. And to quench my thirst: "orange drink". And don't even get me started on the birthday party I had there! Ah, to be a kid again & relive the happiness that visits to McDonald's brought. Except for my kids. Ugh. What have I done? I asked Zoey, "Do you think I've robbed you of happy childhood memories?" I said, "What can I do to make it up to you?" Her response? "Take us to McDonald's & buy us a Happy Meal." OK, so they aren't that emotionally wounded. Long live the Golden Arches!